With the historic Rosetta mission now over, the ESA has compiled a four-minute simulation showing the spacecraft’s complete journey as it weaved around Comet 67P/Churyumov–Gerasimenko. Things get started on July 31st, 2014 as Rosetta began to wind down its 10-year journey to the comet. The probe came to within 60 miles (100 km) on August 6th, and from there, it gradually approached the oddly-shaped comet. Its initial flybys provided the first close-up images of the comet, while allowing mission planners to choose a landing site for the soon-to-be ill-fated Philae lander. Key stages in the mission include Rosetta’s maneuvers as it prepared to dispatch Philae to the comet’s surface, close flybys in February and March of 2015, and course corrections performed to protect the probe from the comet’s increased activity in August 2015. In the spring of 2016, Rosetta went on another far excursion, followed by a close flyby when its instruments made several critical observations. Starting in August 2016, the probe began to fly a series of elliptical orbits that brought it progressively closer to the comet. 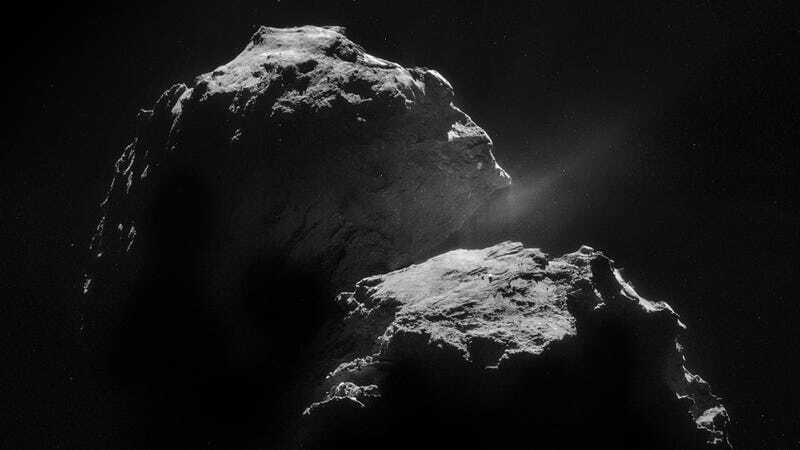 On September 29th, Rosetta was deliberately maneuvered onto a collision course with the giant rock. The probe struck the surface on September 30th in the Ma’at region on the comet’s head, finally ending the historic mission. Watching the simulation, it’s important to point out that, while Rosetta’s trajectory is accurate, the comet’s rotation is not. The arrow indicates the direction to the sun as the camera viewpoint changes over the course of the simulation.